Eucharia talks about stage fright and drama. Todd: So, Eucharia, you are into drama? Eucharia: Yes, I have a Masters in drama and theatre and at the moment I am hoping to get onto a PHD programme in drama and theatre. Todd: So what’s the thing about drama? What excites you about drama? you learn how to read people in drama, so usually I can understand what people are saying even though they might be lying, which comes in handy sometimes. Todd: That would be useful! Eucharia: Yeah, so erm, I think it’s very useful for me as well. I am an English lecturer so I use a lot of drama in my classes such as role plays. And I ask my students to create little plays, little mini dramas so they really respond well because it’s a semi-controlled version of English learning in so far as they can rehearse but it has to sound reasonably natural. So, at the moment I’m hoping to get on to a PHD course which will investigate about drama in the English… in English as a foreign language classroom, so especially I would like to concentrate on a lot of…I would like to concentrate a lot on Asian drama and try to bring Asian theatre to the world’s attention. I don’t know how successful I will be but here’s hoping! Todd: Oh, I’m sure you will be successful! Now, Eucharia, you are into drama. 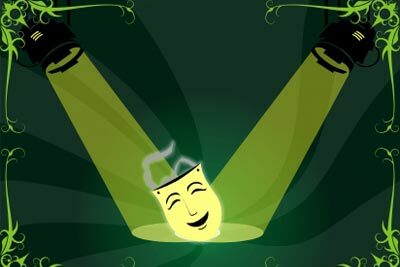 Can you tell…what do you do for stage fright? Eucharia: Yes! I get really bad stage fright but the minute I step into the classroom or the minute I get onto the stage it just all falls into place. I just feel like ‘Yeah this is what I’m made to do’ but the night before it is always the worst case scenario so I am always thinking of what can go wrong. So that’s my particular brand of stage fright but once I get on stage or once I get in front of the class I will be fine. I know this. You learn how to read people in drama. I can read him very well, and I know that there is a problem in his life. She never talks and is impossible to read. I use a lot of drama in my classes such as role plays. Even after the role play was finished, he still thought he was a king. Let's do a role play to practice your interview. It’s a semi-controlled version of English learning in so far as they can rehearse. He was a decent student, in so far as he came to class and did his homework. In this job you will have a lot of freedom, in so far as you can create your own schedule. What do you do for stage fright? I always get stage fright when the teacher asks me to read in front of the class. Even though she had practiced her presentation a hundred times she still got stage fright. The minute I get onto the stage it just all falls into place. The lead singer was sick for the concert and there was no electricity, but somehow everything fell into place and it was a success. Some people get very frustrated when life doesn't fall into place the way they want. He isn't being very proactive about looking for a job. He is more just waiting for things to fall into . Even though the teacher tries to keep the class comfortable, some students still get stage . as it starts every time and has four tires, it is a good car. Conversations on the telephone are more difficult because you the facial expressions of the other person. In our emergency first aid class we do a lot of playing to create practice situations.